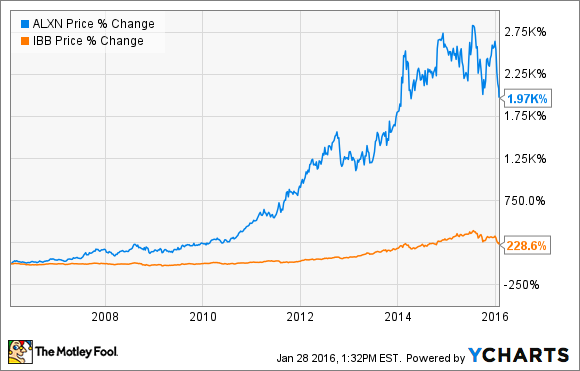 Will 2016 Be Alexion Pharmaceuticals Inc.'s Best Year Yet? With two new drugs launching and a pipeline full of potential, the odds look good that the answer is yes. Photo by Bill Brooks Flickr Creative Commons. Orphan-drugmaker Alexion Pharmaceuticals (NASDAQ:ALXN) has been been a market darling for years. Shares are up a mind-boggling 1,970% during the past decade, which places it well ahead of even the returns of the red-hot biotechnology sector, as measured by iShares Nasdaq Biotechnology ETF. Alexion's stock has walloped the markets over the past few years thanks to the success of Soliris, a treatment for two ultra-rare blood disorders: paroxysmal nocturnal hemoglobinuria (PNH) and atypical hemolytic uremic syndrome (aHUS). Even though both of these diseases are exceedingly rare, Soliris' huge price tag has allowed the company to rake in billions. But can shareholders expect that 2016 will be another great year for the company? Here are a few reasons why I think the answer is yes. Soliris' growth up to this point has been nothing short of stellar. In the last quarter, sales grew by another 20% to $665 million, and those figures would have been even higher if you adjust for currency fluctuations. Those numbers should continue to head higher in 2016, as diagnosing a patient with PNH is very difficult, so many patients don't even know they have the disease yet. The company has put initiatives in place to help providers better diagnose the disease, and as those play out, more patients will start to receive treatment. Alexion is also expecting big things from Soliris' ability to treat aHUS, which should be an even bigger market opportunity than PNH. Beyond aHUS and PNH, Soliris is currently in advanced clinical testing as a possible treatment for four other diseases related to organ transplantation or neurological disorders. Alexion is currently in the process of rolling out two new drugs to market, which should have the dual benefit of turbo charging its growth rate, and diversifying its revenue base. The first drug that it's launching is called Strensiq, a home-grown treatment for hypophosphatasia, or HPP, which is an ultra-rare genetic disease that causes bone minerals to become defective and can lead to respiratory failure or death. Alexion won regulatory approval for Strensiq in Japan, Canada, the U.S., and E.U. in 2015, and the company is currently in the process of setting up reimbursement as it prepares for launch. Alexion's other drug that is set to launch in 2016 is Kanuma, a treatment for lysosomal acid lipase deficiency, or LAL-D, another ultra rare genetic disorder. Alexion got its hands on Kanuma from its $8.4 billion acquisition of Synageva Biopharma, so it's expecting the drug to be a big winner to help justify the acquisition. Kanuma has already won approval in the U.S. and EU. Combined peak sales estimates for Kanuma and Strensiq top $1.7 billion. It might take some time to get there, but with both drugs set to ramp over the coming quarters, Alexion's top line should have no problem continuing higher. Biotechnology stocks often rise and fall based on the strength of their pipelines, and Alexion looks good here, too. The company currently has 10 different early or advanced clinical programs up and running, and it has announced plans to add another four to that list in 2016. It also is in the preclinical stage with another 30 programs. Image Source: Alexion investor presentation. The company also has an ace up its sleeve if any of these clinical programs find their way into regulators' hands. Earlier this year, it won two FDA priority review vouchers that allow it to speed up the review of any drug that it chooses. With Soliris poised for growth, Kanuma and Strensiq launching, and a large pipeline moving down the clinical pathway, Alexion has positioned itself for a great 2016. It wouldn't surprise me one bit to see this stock torch the IBB, yet again.